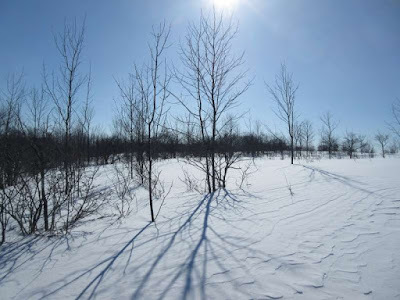 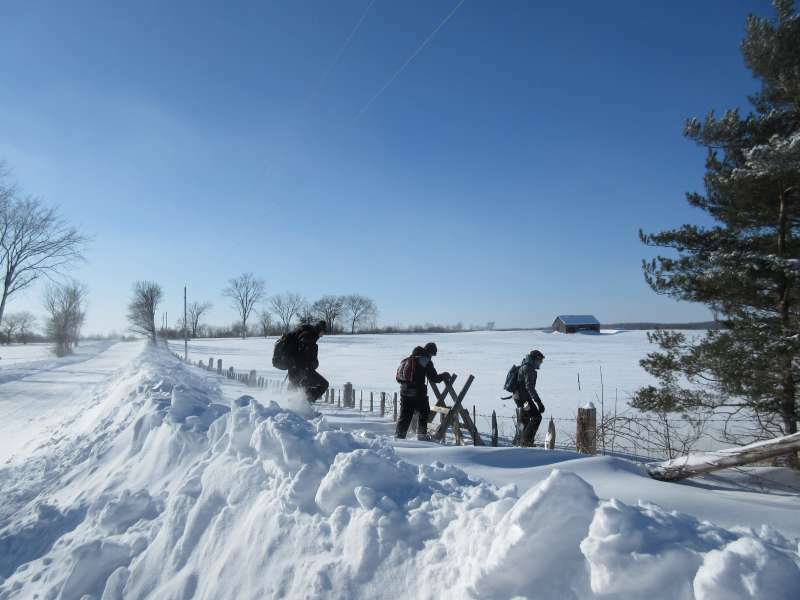 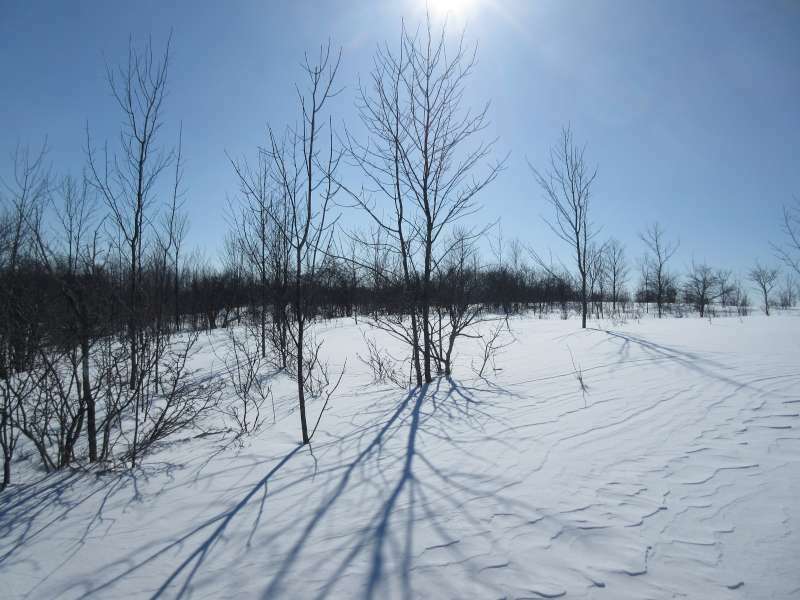 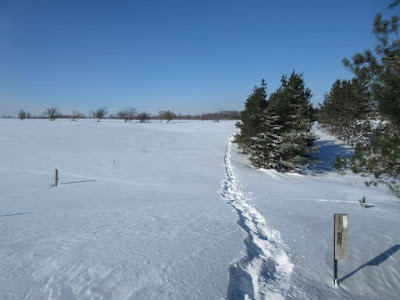 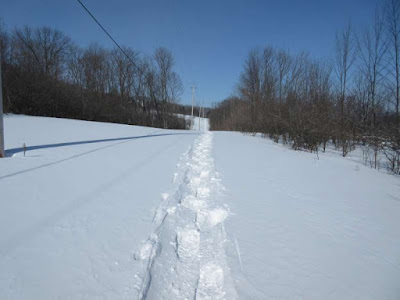 The dreadful hike on November 24, 2013, when we were shocked to find knee-deep snow in the Dufferin Hi-Lands and ended up slogging through knee-high drifts, has us thinking that we should do a hike where we are actually properly prepared for snow: on snowshoes! Several of us own snowshoes and, for the others, Whitney and Janette kindly help implement the rental for us by picking up the gear at MEC in downtown Toronto. 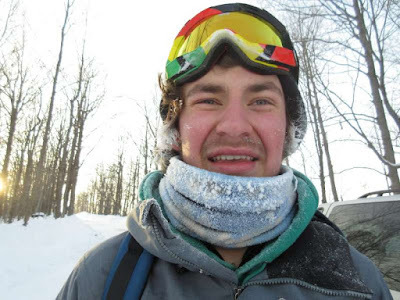 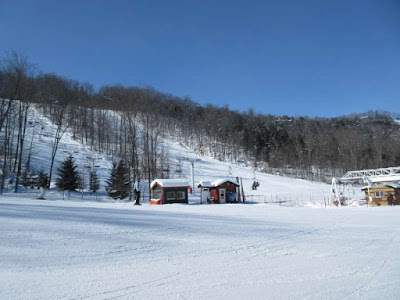 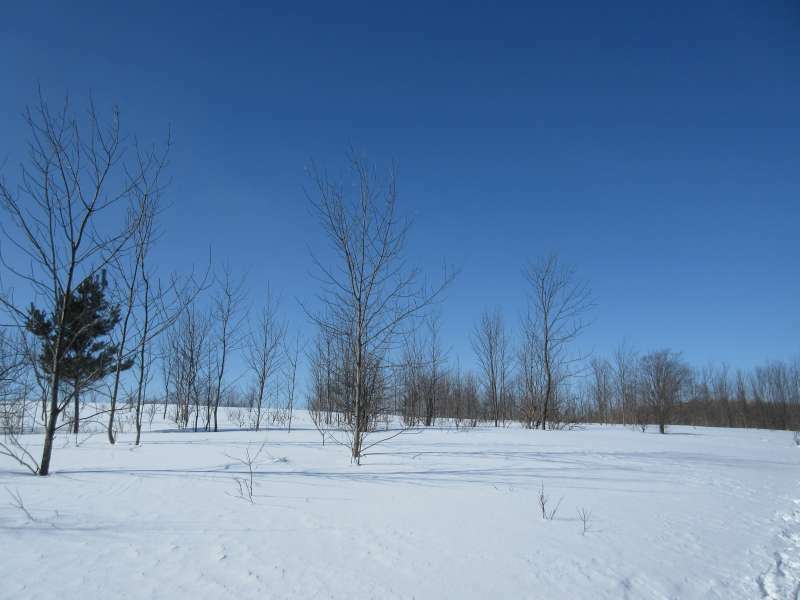 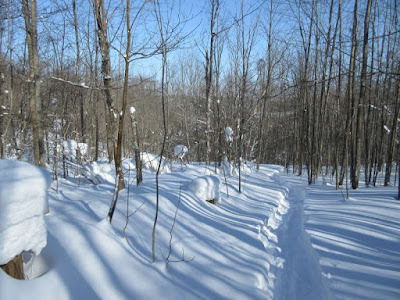 We tried sourcing the rentals at Outdoors Oriented in St. Catharines and MEC in Burlington but because this is the Family Day weekend in Ontario, there aren’t enough pairs available. 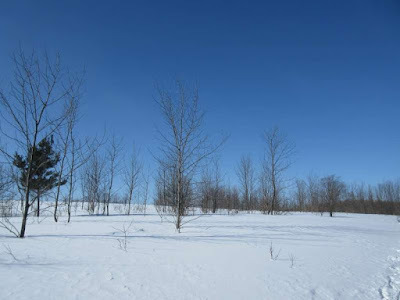 It is a bitterly cold day, with temperatures at -22 C and a windchill much colder than that. The forecast convinces Steve not to join us, but we have bundled up well and expect that, because we will be moving, we will be fine. 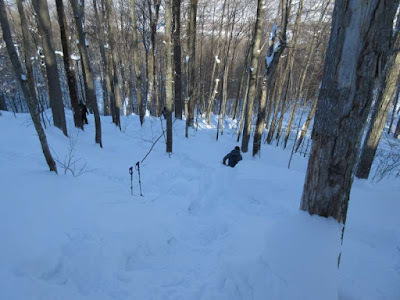 We leave the parking area and head up the road, but the boys, who are in the lead, miss the mark for the turn-off to the trail, meaning that we have to turn around and go back down the hill we just ascended. 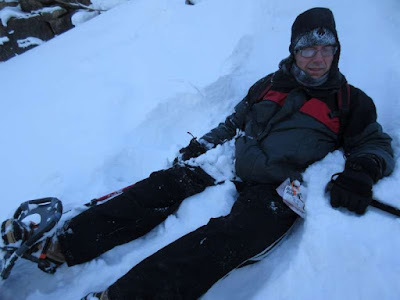 We are cheery and fresh so we think “no big deal.” Little do we know that the gruelling exertion that awaits us means we will end up regretting every extra step. As we leave the road and join the trail under a hydro line I am disappointed to see that someone else has already hiked this in snowshoes before us. 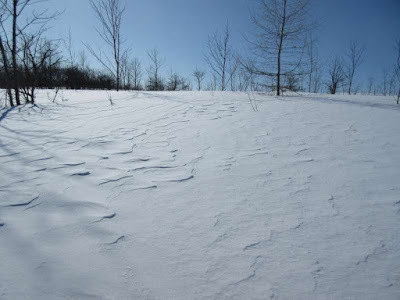 I was expecting that we would be hiking through trackless wilderness: This is supposed to be an adventure and I don’t want to walk where someone has gone before! 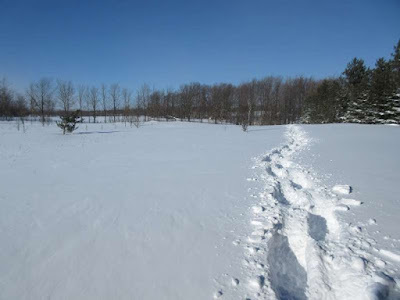 Little do I know that the gruelling exertion that awaits us means I will soon be VERY grateful that someone is ahead of me. 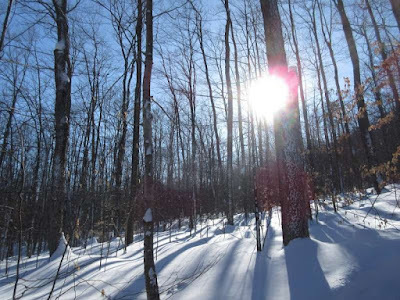 Yes, it is cold but it is also mostly clear and sunny and we are enjoying the experience. 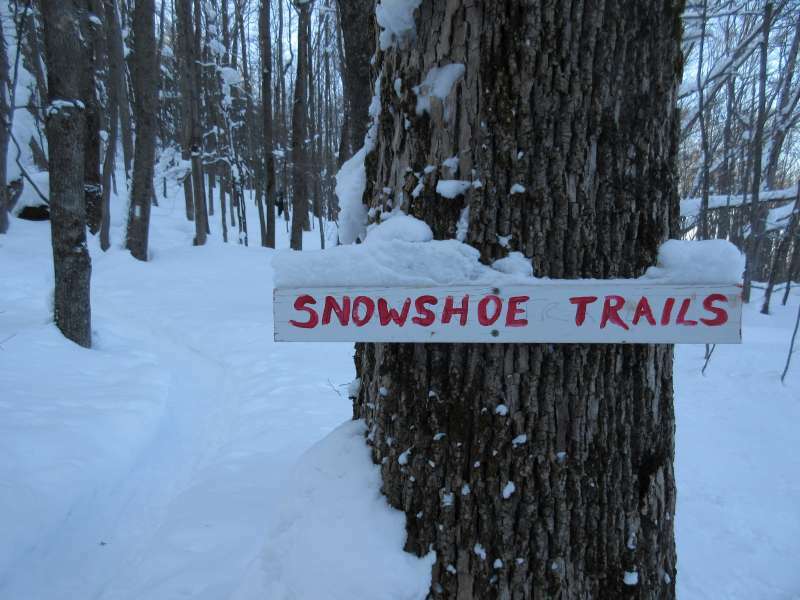 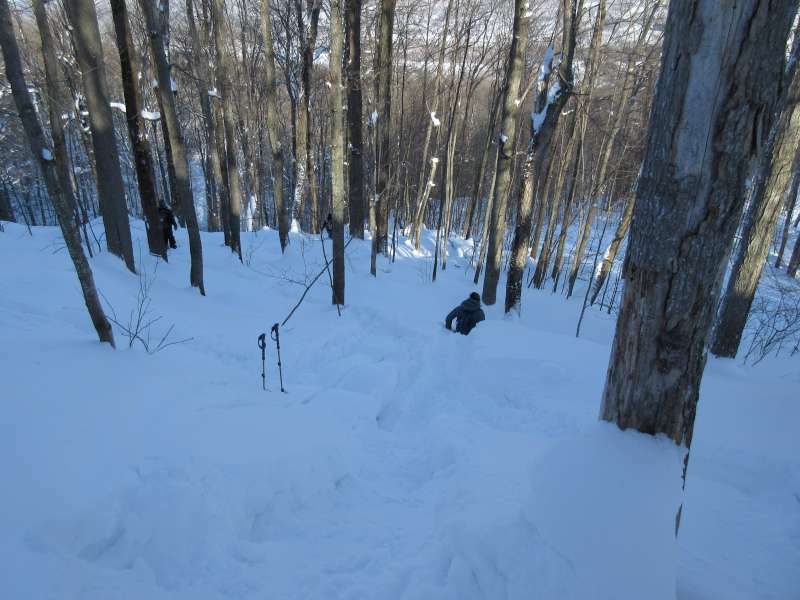 The snow is very deep and there is no way this terrain could be covered without snowshoes. 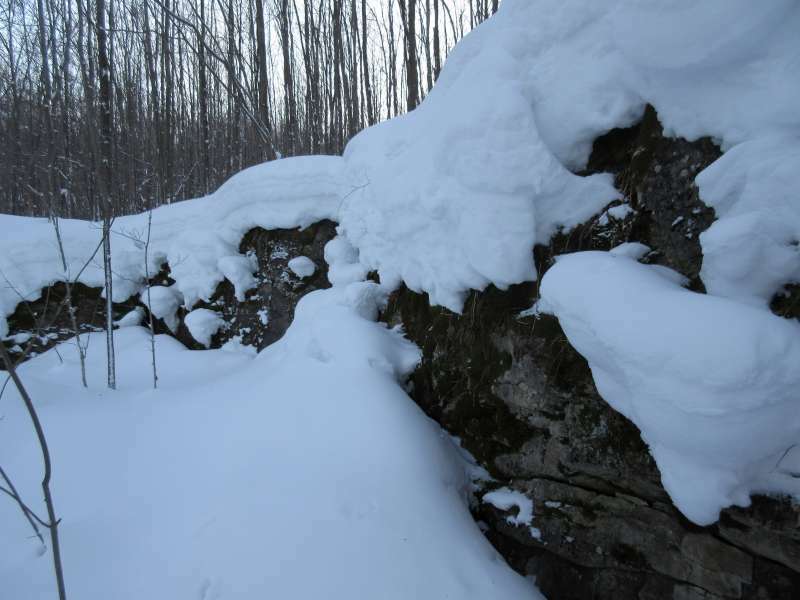 We also realize that the snow has obscured all the rocks, roots and crevices that are normally a part of a Bruce Trail hike. In some cases it has also obscured the blazes. 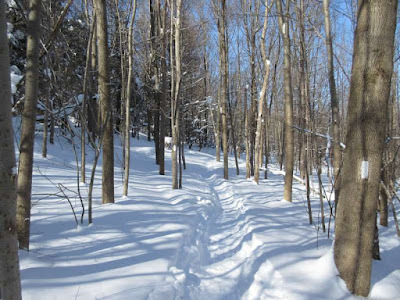 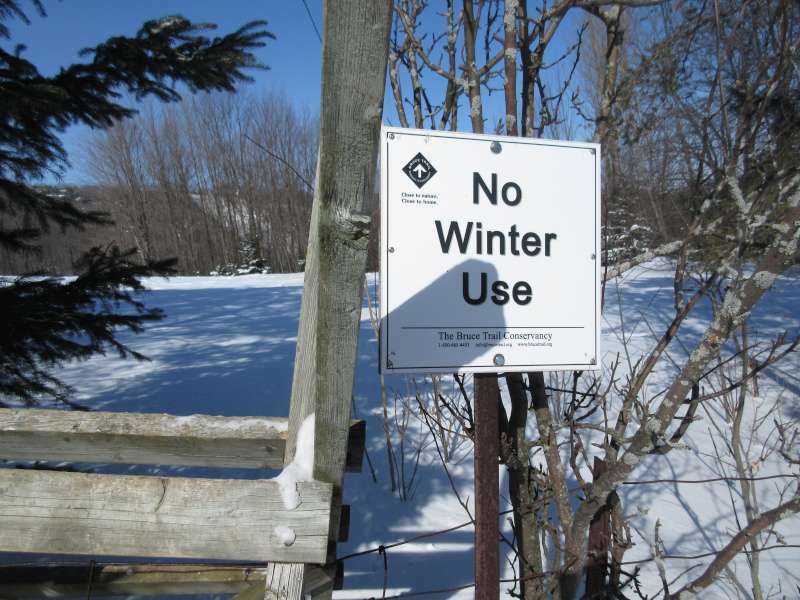 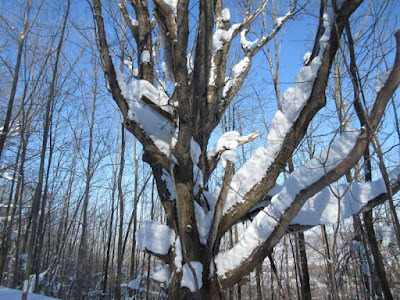 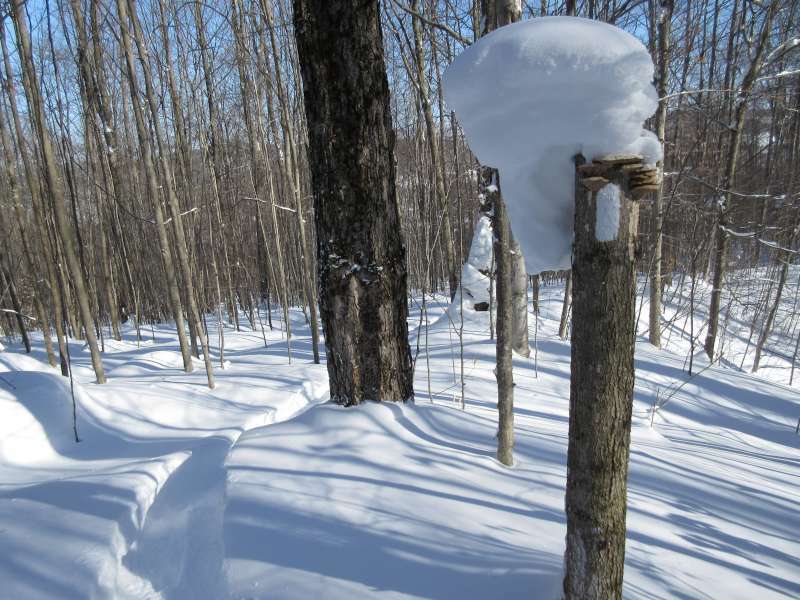 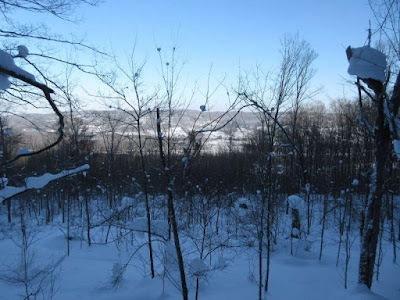 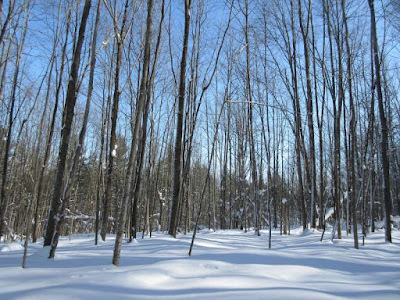 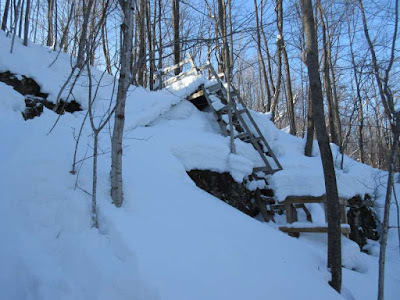 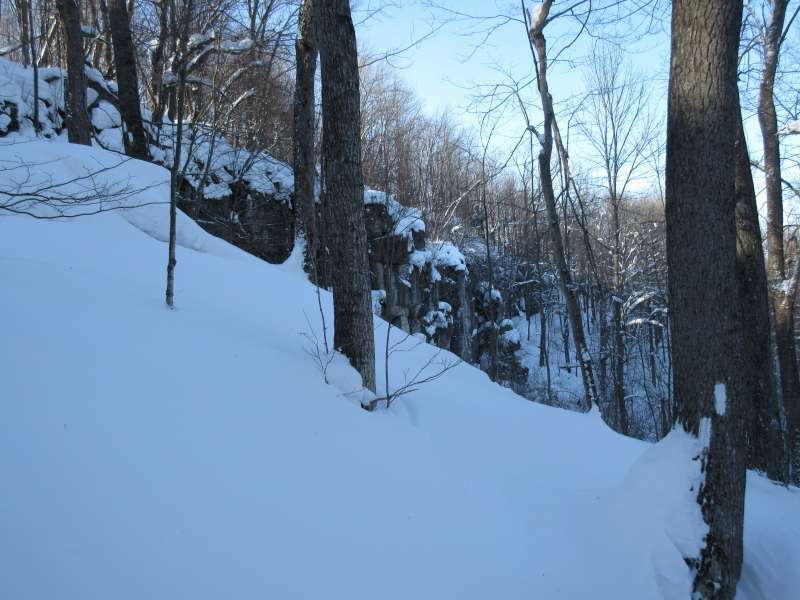 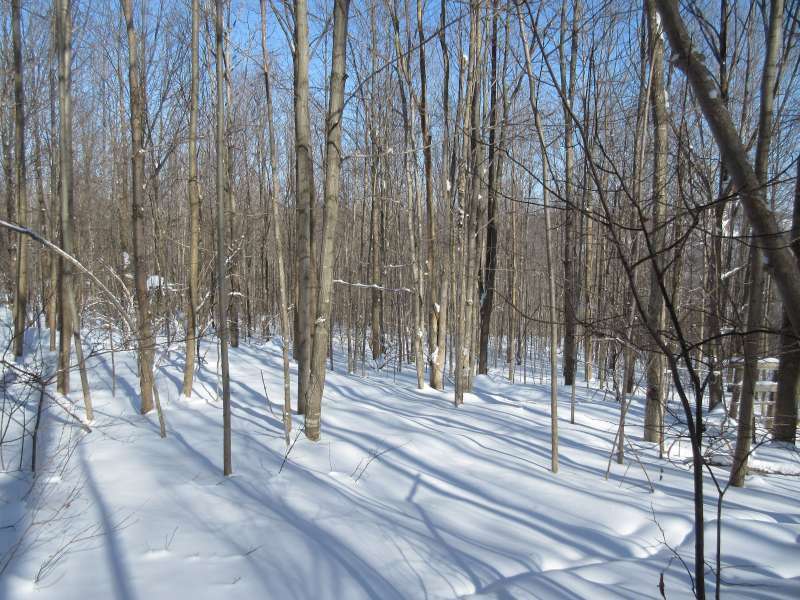 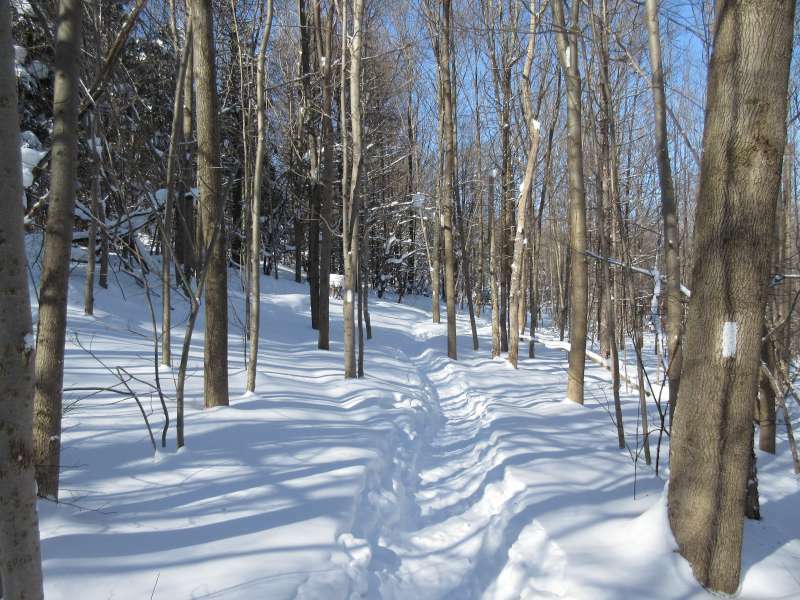 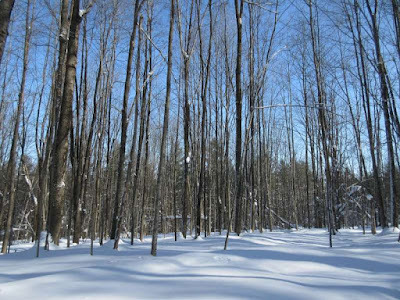 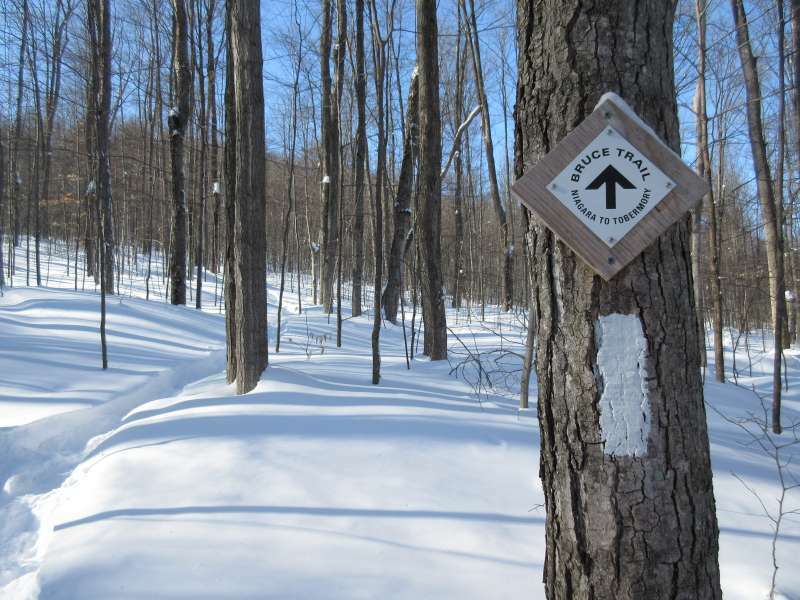 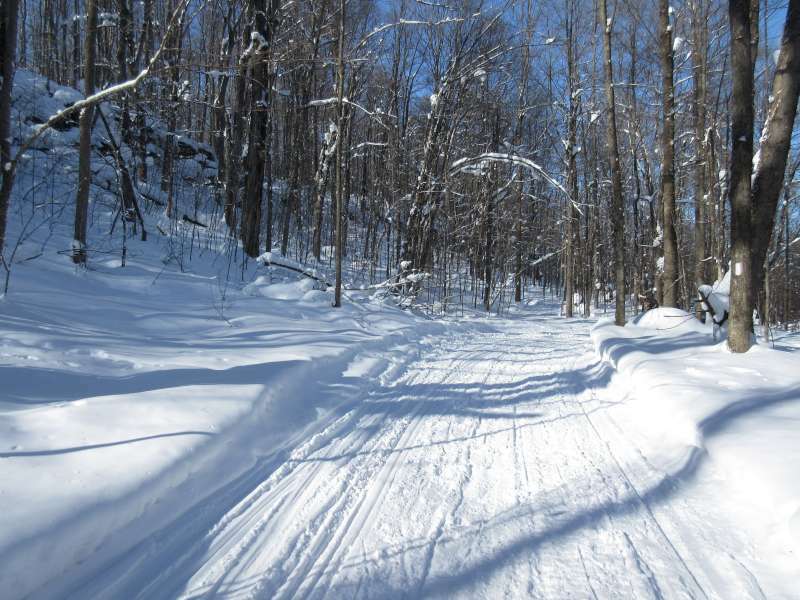 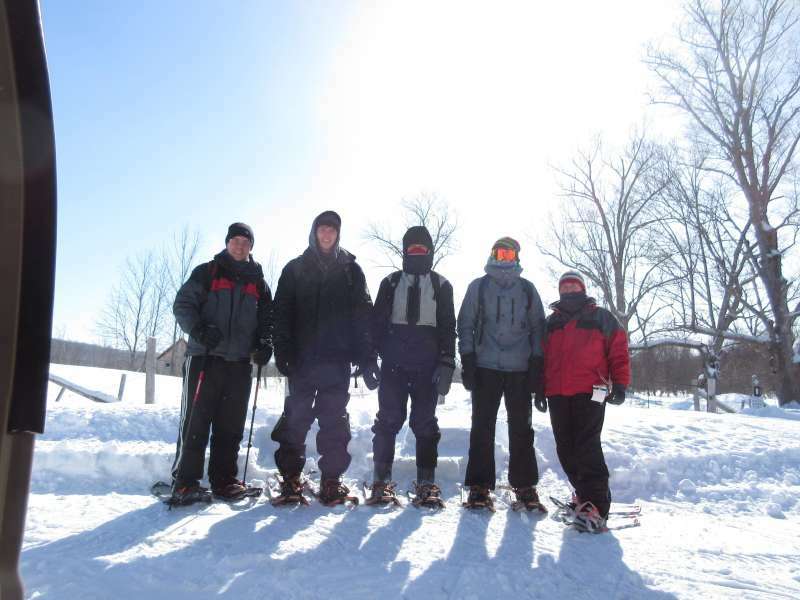 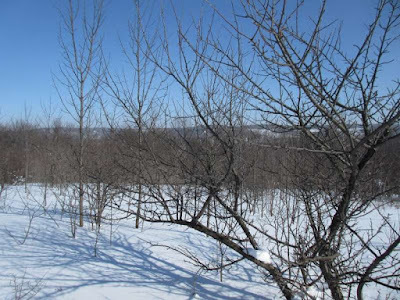 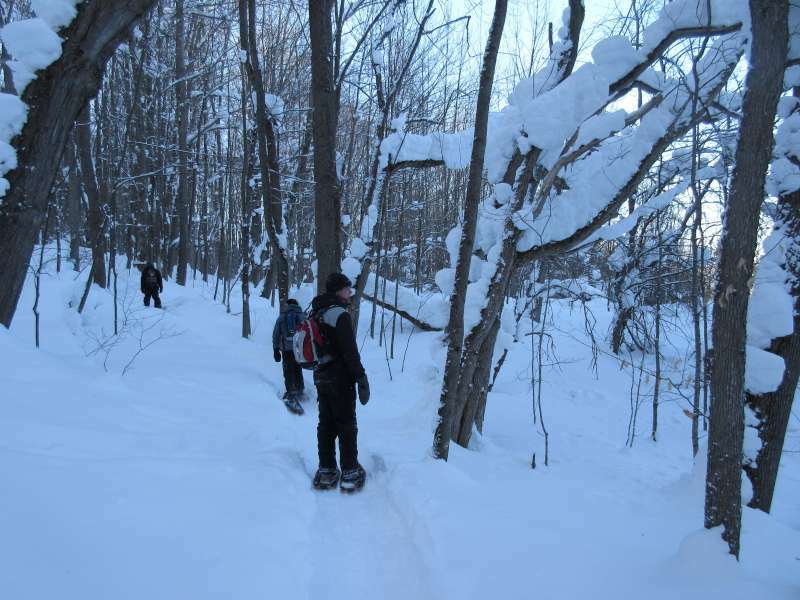 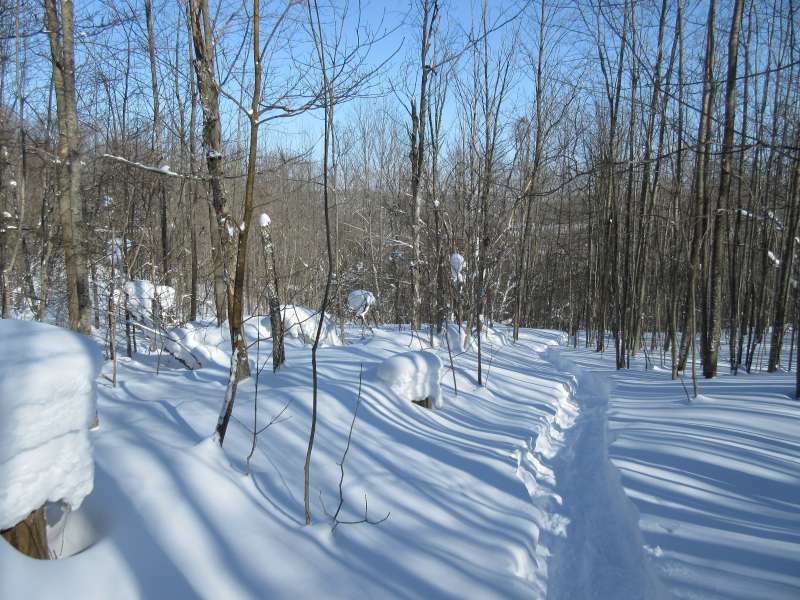 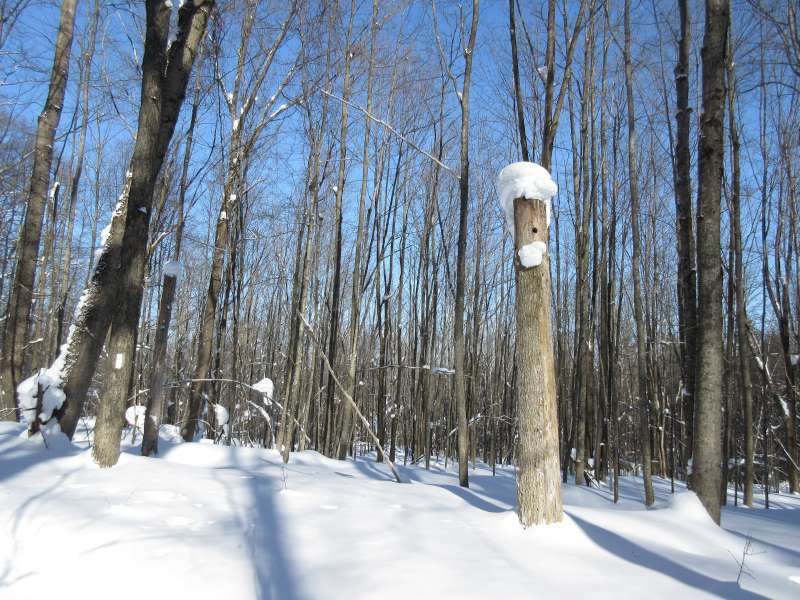 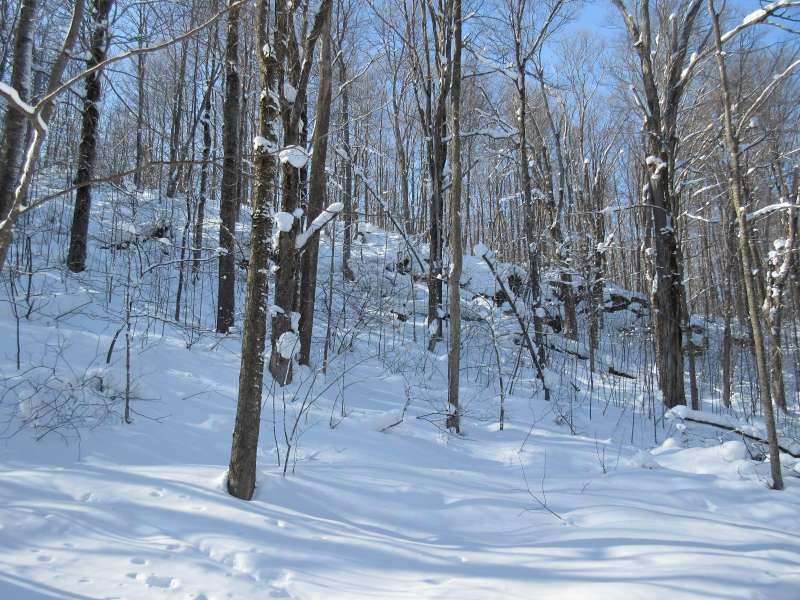 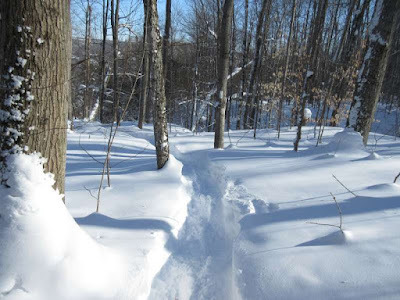 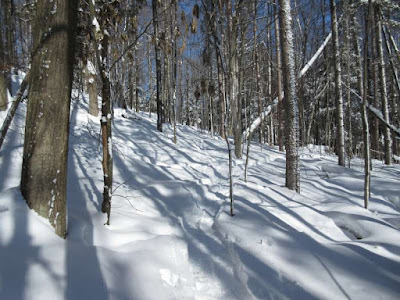 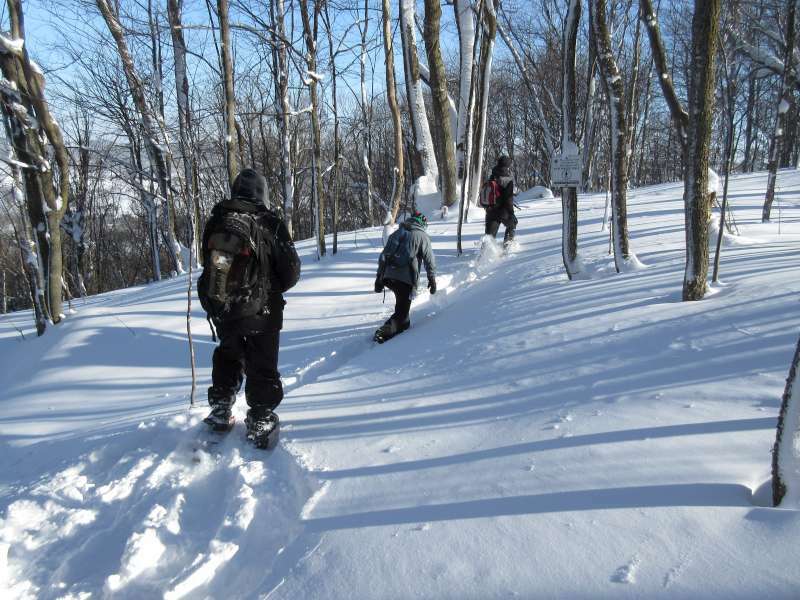 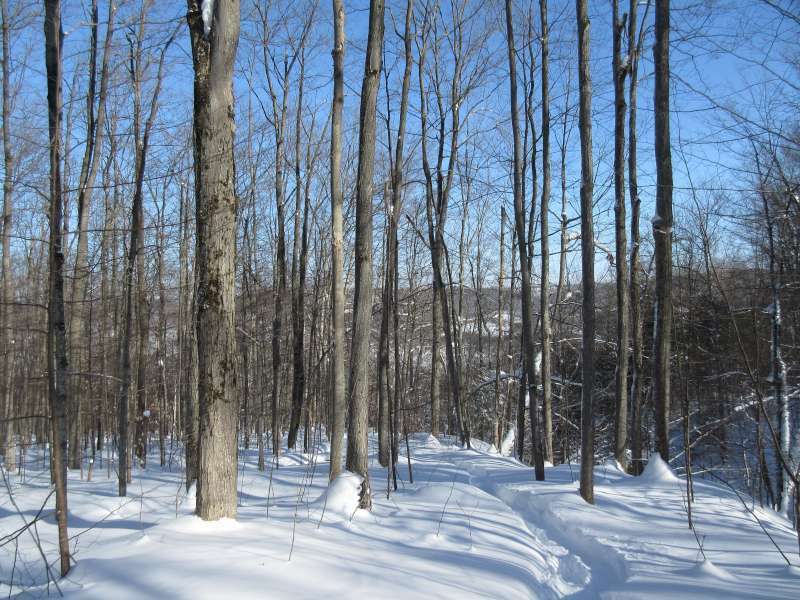 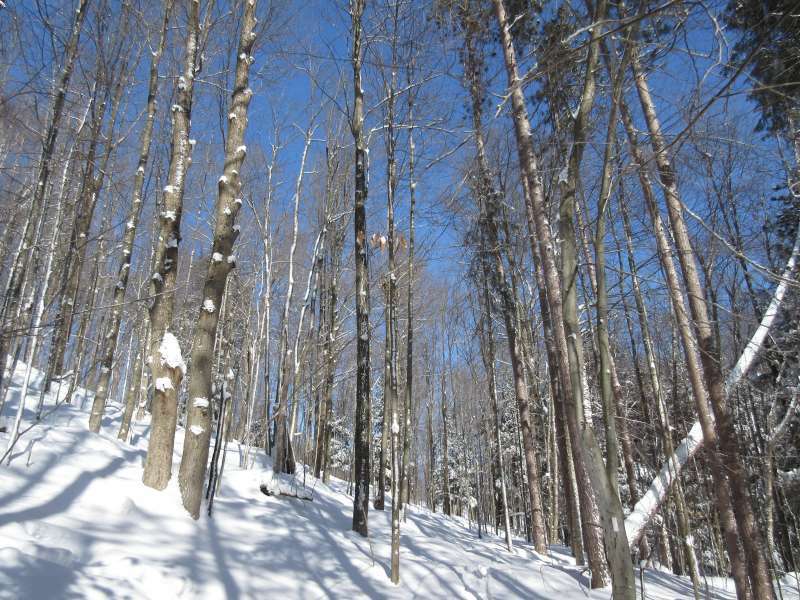 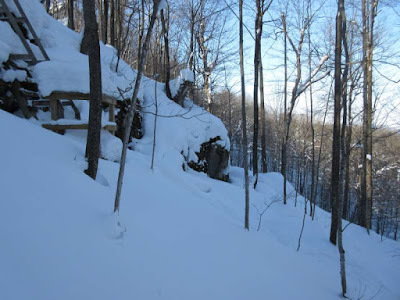 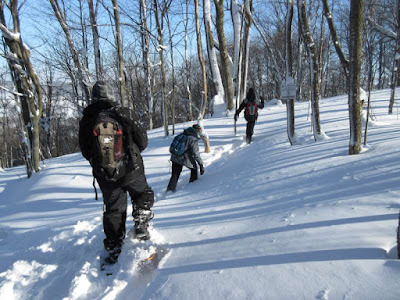 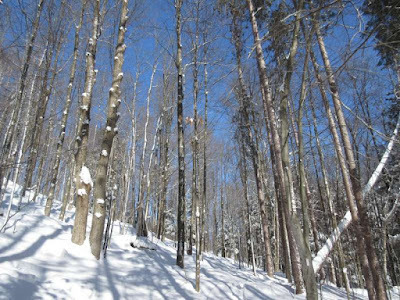 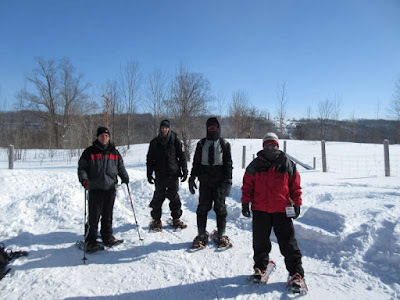 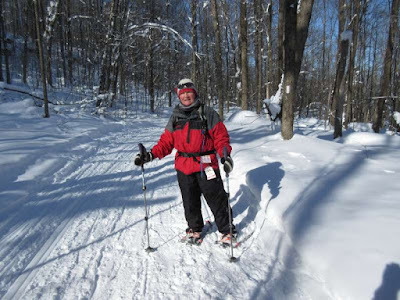 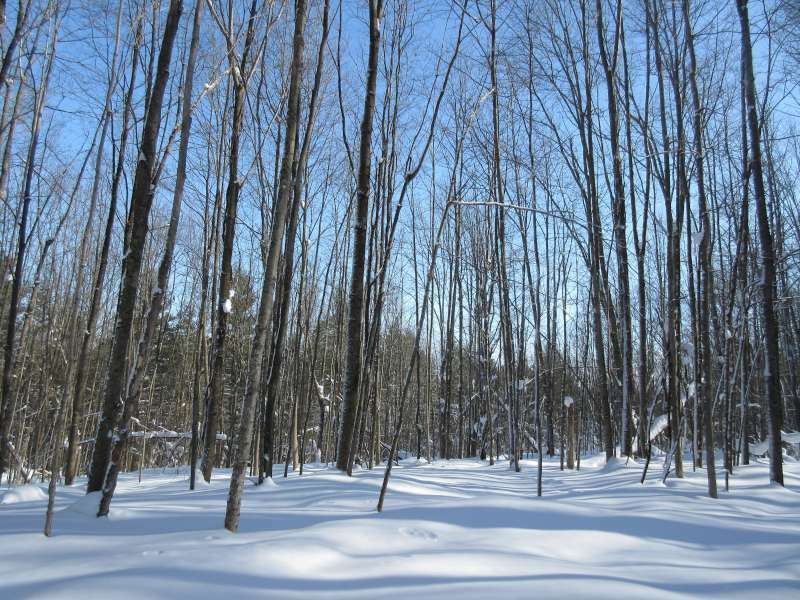 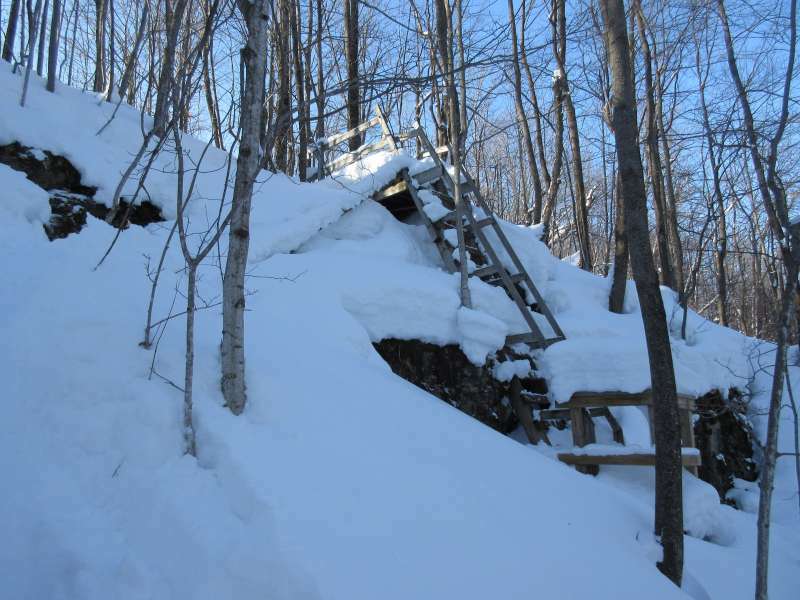 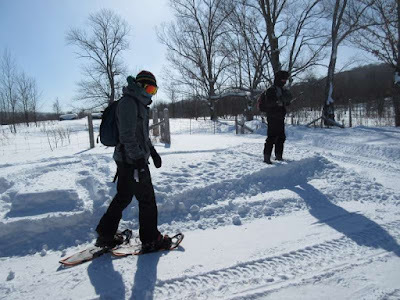 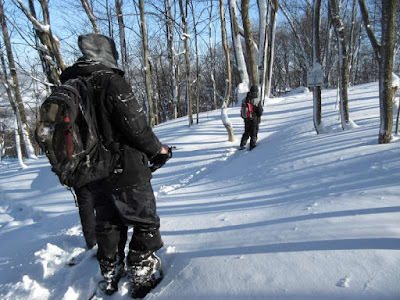 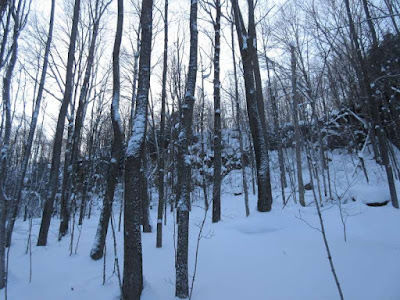 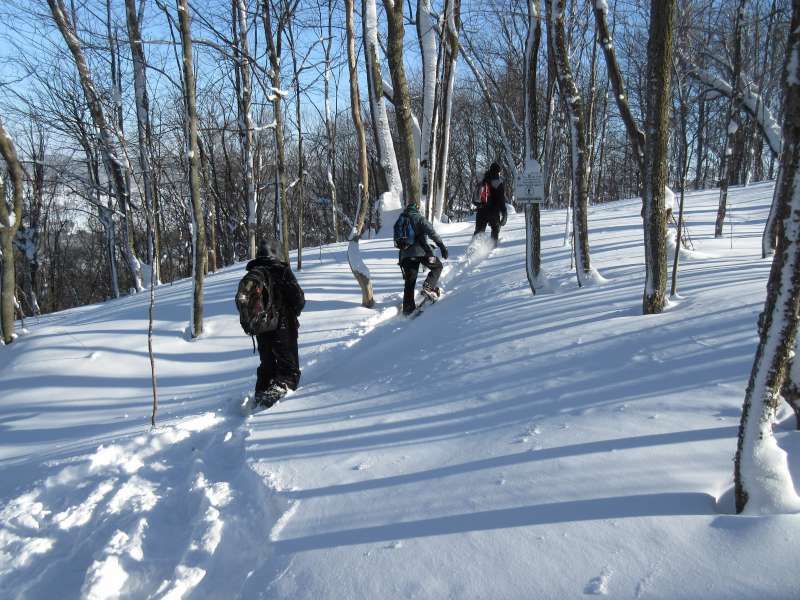 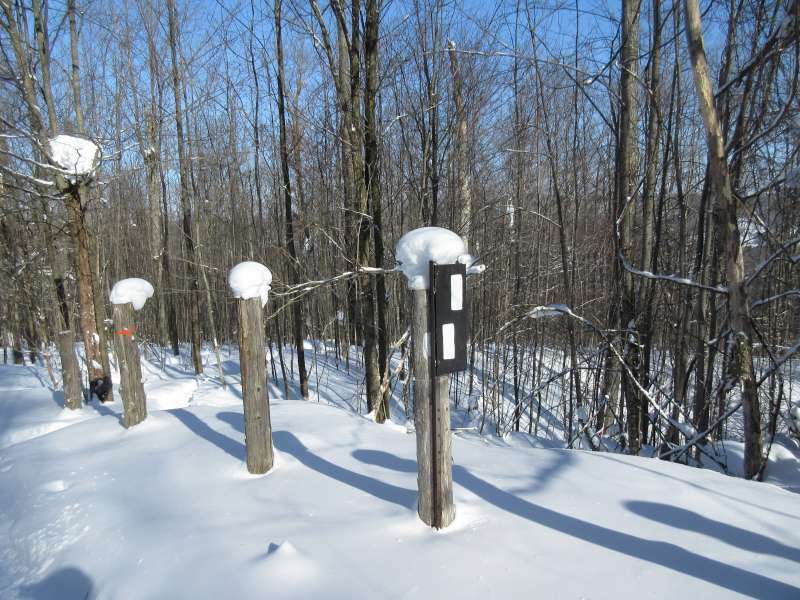 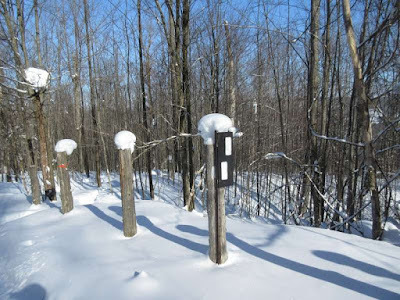 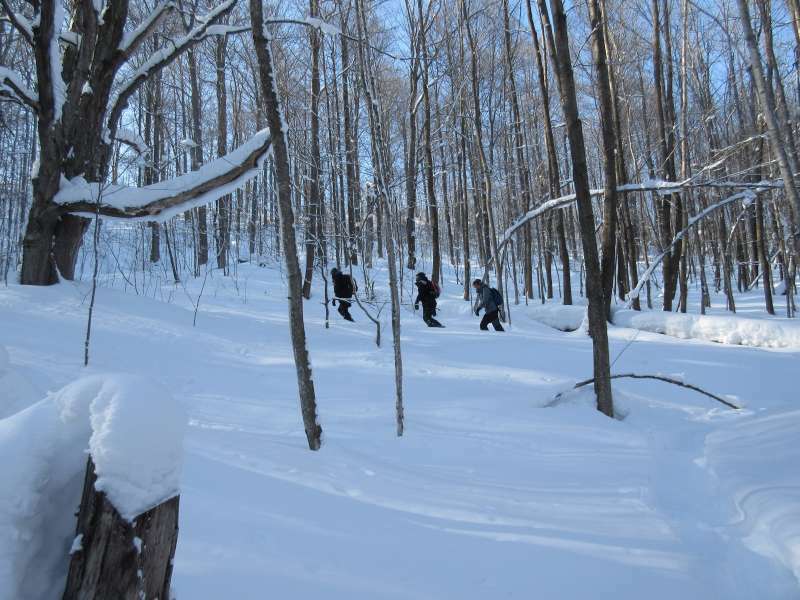 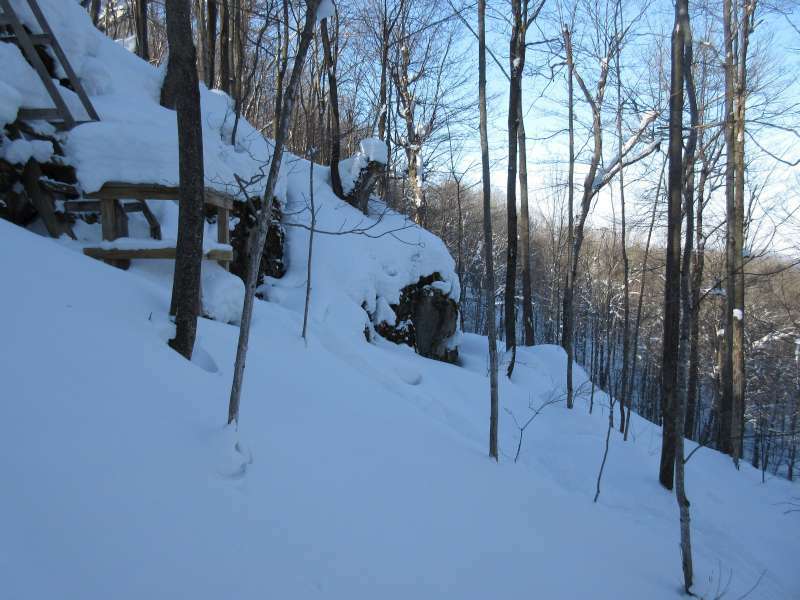 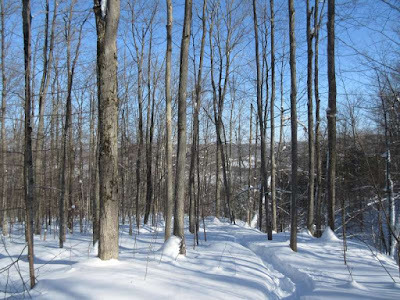 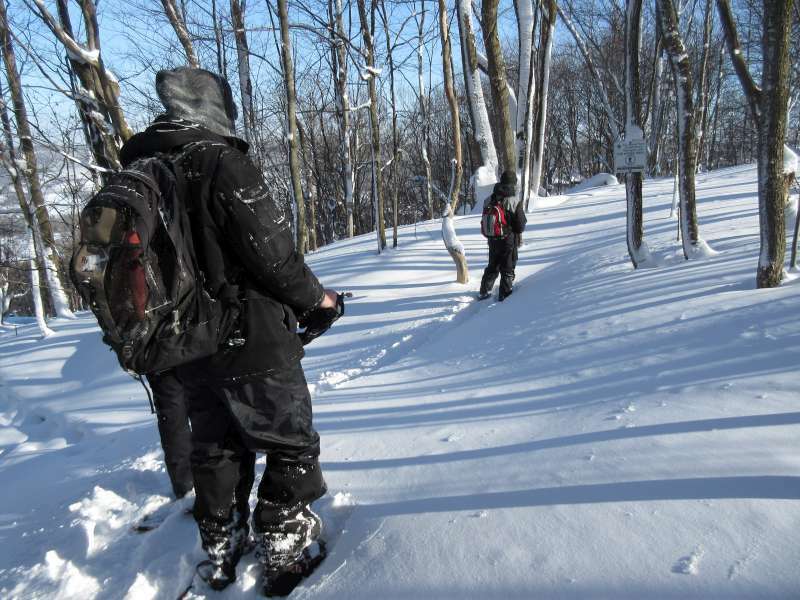 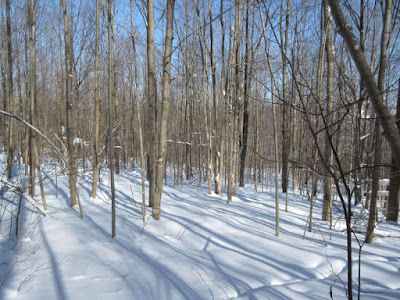 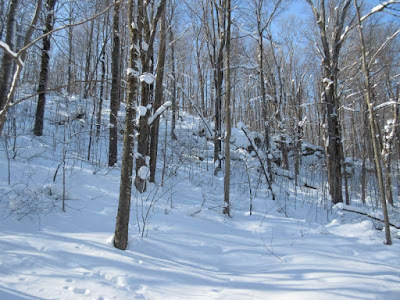 When we get to a steep descent of the escarpment where there is a wood ladder to assist us, we will need to remove our snowshoes in order to safely navigate the steps. 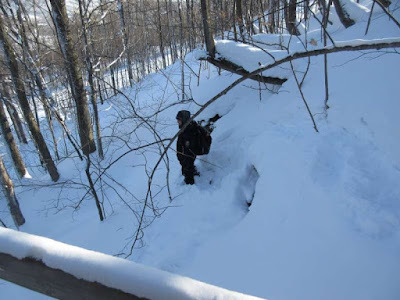 None of us wants to take the time to do that, or to remove our mittens to undo the straps, so Jacob decides to jump and slide down the escarpment. 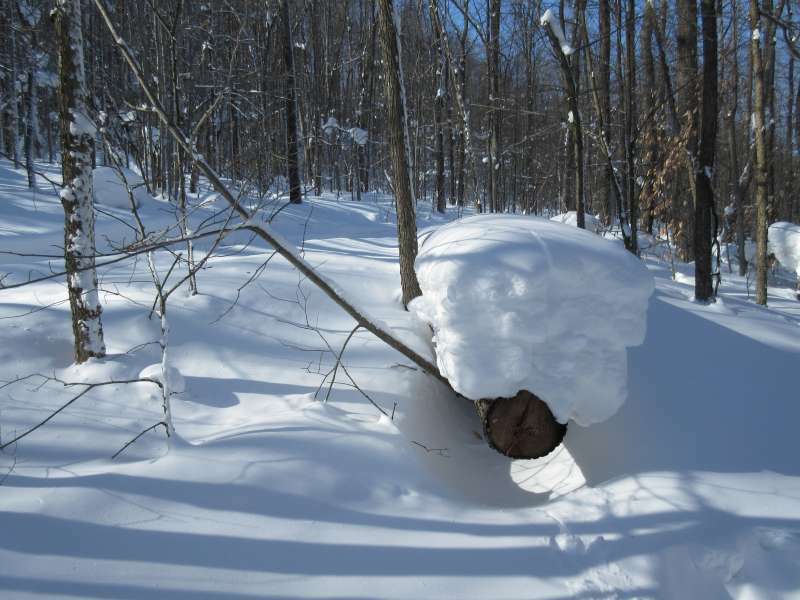 The snow is so deep and powdery that we all follow his example. It’s weird to feel the snow sliding beneath my snowshoes and to realize that I couldn’t stop if I wanted to. This is a small feeling of what an avalanche must be like – the moving snow feels like liquid. 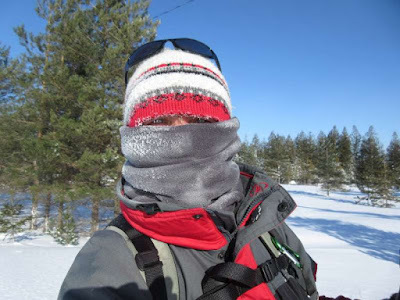 When we hike through an open field and the wind blasts us with full force, our eyelashes freeze and Dean gets frost-nip on the tiny bit of his exposed ear. 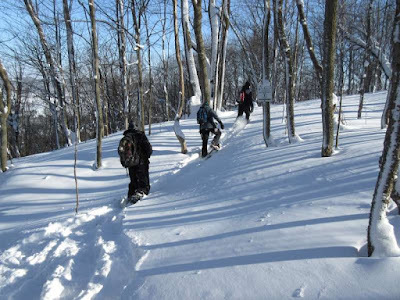 For almost all of this hike Ben, Simon and Jacob are in the lead and we are very grateful for their strength and youth. 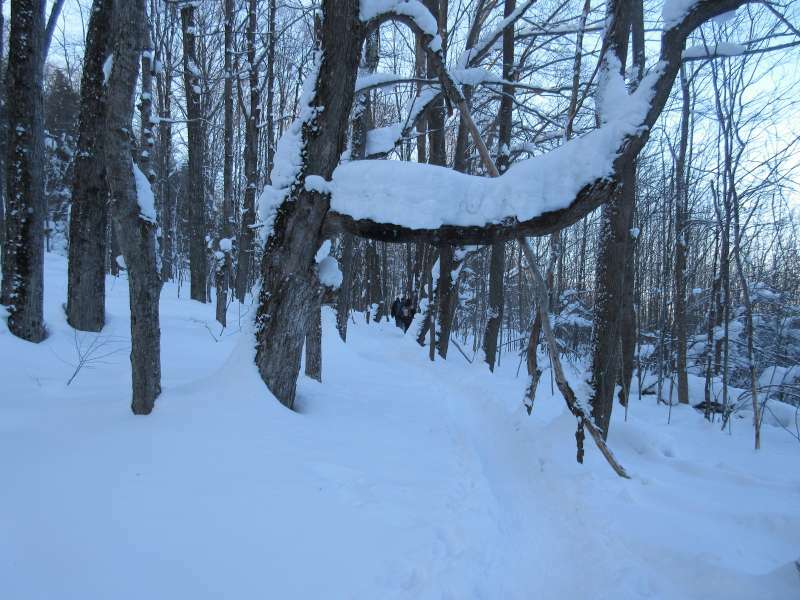 About half of this hike is through my desired unbroken snow but I will not wish for that again – much too difficult! However, having snowshoes allows you to experience a true taste of Canadian winter and we are glad to be alive and outdoors. 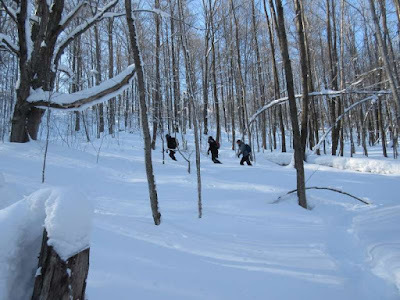 It’s wonderful!